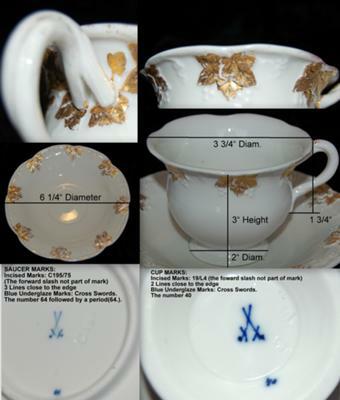 Meissen Mark & Dating Query - Cup and Saucer:- Hello I recently acquired a tea cup and saucer and I would like some help on identifying these pieces. I have already completed quite a bit of research however, I still do not feel as though I know enough to be able to distinguish the difference between an authentic piece of Meissen and/or a repro/copy. I would really appreciate any information regarding these pieces. I am mainly interested in whether these pieces are authentic Meissen, dating based on mark, style/pattern and any other information applicable. I would like to thank everyone in advance and for sharing any knowledge you may have about this piece. The cup appears to have very small spots of gold left on the pedestal base, around the rim and approximately an inch or so from the top of the rim, inside the cup. The saucer also has quite a bit of wear and appears to have had a gold rim. Both pieces are free from chips, cracks, crazing. 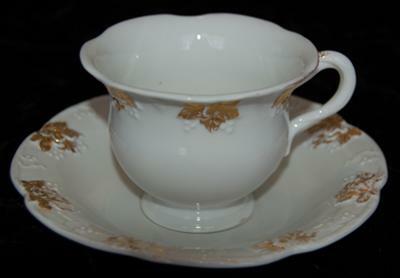 The porcelain condition is mint however, the gold has significant wear. I hope this information proves to be helpful. Thank you very much. Dear Shawn, Dating Meissen porcelain marks is almost an art form. My best information suggests the mark on your cup & saucer dates from 1924-1934 and that they were made by State's Porcelain Manufactory, now known as KPM, Meissen, Saxony, Germany. I do not, however, consider myself an expert on Meissen marks but I believe this to be very close if not correct. There are several websites with excellent information you can find by doing a Google search for "dating Meissen porcelain". Here is the link to one such site, you need to scroll down a bit on the page to get to the Meissen section. Hi there, just a bit of help with your cup & saucer. The mark on it is the Meissen mark called the (POMMEL) mark in this form, that is with curved crossed swords with pommels on the handles, it date your C/S to 1850-1924. Hope this help. Regards, Stewart.